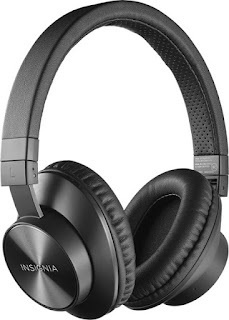 Today only, while supplies last, get this pair of these Insignia™ - NS-CAHBTOE01 Wireless Over-the-Ear Headphones for ONLY $24.99 (Retail $39.99)! Walk around while you listen with these Insignia over-the-ear Bluetooth headphones. Pair these comfortable earphones, which have a 33-foot range and a reliable Bluetooth 4.0 interface, with your computer or smart device to stream music wirelessly. These Insignia over-the-ear Bluetooth headphones have a built-in microphone and in-line controls, which let you take calls easily.